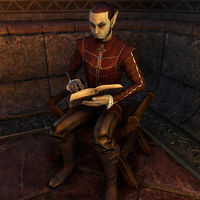 Nivan Morvayn is a Dunmer scholar who can be found in Saint Delyn Waistworks in Vivec City. He can be found spending time in the northeast corridor. He has no dialog. This page was last modified on 30 September 2017, at 01:27.